The music always entertains, and even after visiting this show so many times, it still amazes. 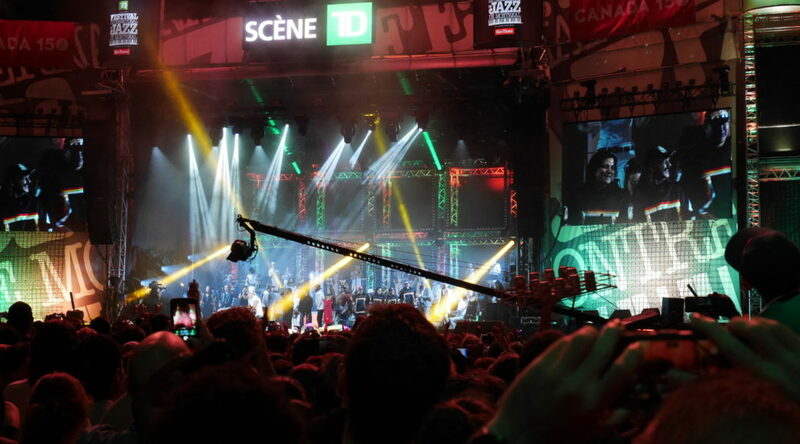 The best choices for me are the Groove Stage or the Blues Stage, around the Parterre du Quartier des spectacles area, Rue St-Urbain between Maisonneuve and Ste-Catherine. And the Main Stage at Place des Festivals if if the someone really good. The Main Stage is very large, but it gets packed, and it is very claustrophobic at the front. So I stay in the back, near Ste-Catherine side, and use my binoculars! They have large screens for the audience in the back, and the sound system is great. Still keeping a watch for decades now: Lips! Overflow stage, used for the main events since even a whole block is not enough! Discothèque blowout Saturday, July 1 at 9:30 p.m. at Place des Festivals. The whole Place des Festivals block was full. A bit surprising, given the weather forecast of thunderstorms at that same time. So I came prepared with rain jacket and pants. Very few others seemed prepared though, looks like they were planning on following the kids who enjoy getting wet playing around in the fountains at the festival. And new twists this year! Looks like every year the Montreal Jazz Fest organizers add interesting twists. This year, they had dancers on lighted pedestals spaced along the entire length of the crowd, so being at the back does not seen so far way from the scene. And of course, for years now they have had big screens at the back showing the action on the main stage. This main discothèque show used two stages – Men without Hats played on a small side stage. Have to stand for 90+ minutes for these shows, but I can still do it! Carly Rae Jepsen of Call Me Maybe fame, Montreal electro-pop new-wavers Men Without Hats, Acadian hip-hop/etc. band Radio Radio, pioneering Quebec rap ensemble Muzion, aboriginal singer-percussionists the Buffalo Hat Singers and DJ Champion.